If born in the west you maybe considered upper class, middle class or lower class. If born in the east you may be of the princely-caste, or possibly an out-caste. Wherever you were born you will have a label, a number, a brand, a classification! Privileges or restrictions will be your lot in life as you ‘bow’ to the system! But scripture teaches that there are three classes of men in the world today. Scripture gives a threefold categorisation of this triplet of mankind. Scriptures relates an all-comprehensive classification of everyman, and Scripture alone is the plumb-line that unfolds this amazing truth. In four short verses Paul outlines the truth of these three men:- 1) the Natural Man ……..unsaved 2) the Spiritual Man…….saved 3) the Carnal Man……….saved. In one small section of Scripture we are given this vital information. Particulars that influence the life and future of everyone born of woman. Information that affects ever person born into the old creation in Adam. The natural man is the state into which all of humanity is born: for the natural man does not receive the things of the Spirit of God, for they are foolishness to him; nor can he know them, because they are spiritually discerned. The natural man is made up of the old creation in Adam and the old Creation in Jacob. The natural man by birth is an A-theist – a non believer in the Son of Man. The natural man by origin is born into the kingdom of darkness.. The natural man by lineage is dead in trespasses and sins. 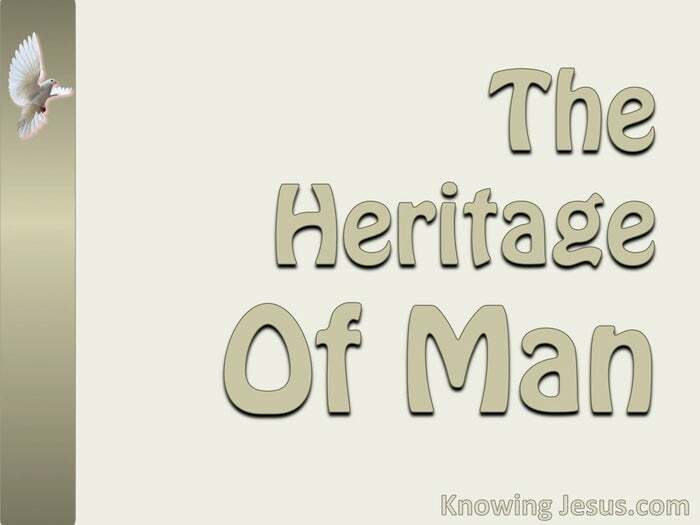 The natural man by heritage is a child of Satan. The natural man is condemned already – because he has not believed in the only begotten Son of God. Both spiritual and carnal have been born from above and are accepted in the Beloved. Both spiritual and carnal have been transferred into the kingdom of light. Both spiritual and carnal have been born into the new creation in Christ. Both spiritual and carnal are baptised by the Spirit of God into Christ. Both spiritual and carnal are designated children of God. Both spiritual and carnal are in-dwelt permanently by the Spirit of God. 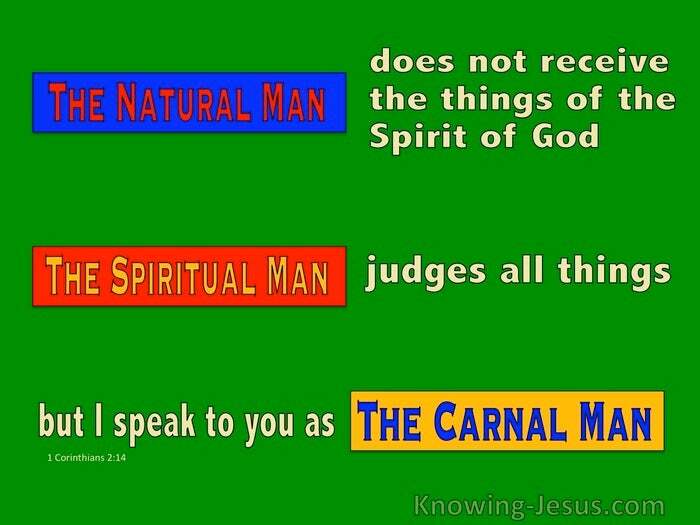 Both spiritual and carnal are coheirs with Christ Jesus. Here in a few verses we see three the groups of humanity.. but we see two categories of Christians. It is to carnal Christians today that Paul’s correcting monologue is addressed: And I, brethren, could not speak to you as to spiritual people but as to carnal, as to babes in Christ. (read thru the whole of 1 Corinthians 2 and 3 for Paul’s condemnatory comments). I fed you with milk and not with solid food; for until now you were not able to receive it and even now you are still not able; for you are still carnal. For where there is envy, strife, and divisions among you, are you not carnal and behaving like mere (natural) men?